Apollo enjoyed showing up now and then at the various temples around ancient Greece built in his honor. One day, Apollo swung by the temple in Troy. 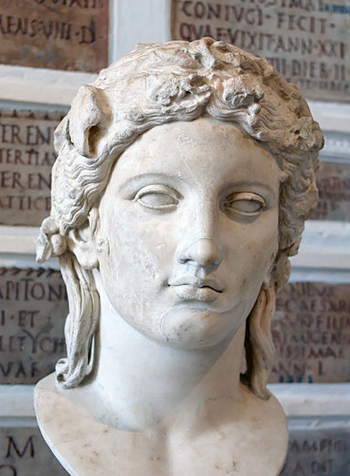 Apollo offered Cassandra a deal. He would give her a very special gift, the gift of prophecy - the ability to see the future - if she would give him a kiss. Cassandra thought that was a great deal. With a laugh, Apollo gave her his gift. Instantly, Cassandra could see the future. She saw Apollo, in the future, helping the Greeks destroy Troy. When Apollo bent his head to gently kiss her, she angrily spit in his face. Apollo was furious. He could not take away his gift. That's not how it worked. But he could add to it. Although Cassandra could, forever after, see the future, no one would believe her. That was his added gift. And no one did. When Cassandra begged her people in Troy to watch out for the Tro jan horse, not one person believed her.